There are some other pages about Google Ranking Signals that don’t consider up-to-date information or sometimes use questionable critical thinking to argue that some of the signals that they include are actually something that Google considers. I’ve been blogging about patents from Google, Yahoo, Microsoft, and Apple since 2005, and have been exploring what those might say are ranking signals for over a decade. Representatives from Google have stated that “Just because we have a patent on something, doesn’t mean we are using it.” The first time I heard them say that was after Go Daddy started advertising domain registrations of up to 10 years, because one Google patent (Information Retrieval Based on Historical Data) said that they might look at length of domain registration as a ranking signal, based on the thought that a “spammer would likely only register a domain for a period of one year.” (but actually, many people register domains for one year, and have their registrations on auto-renewal, so a one-year registration is not evidence that a person registering a domain for just one year is a spammer.). I’ve included some ranking signals that are a little older, but most of the things I’ve listed are from the past five years, often with blog posts I’ve written about Google rankings, and patents that go with them. This list is a compilation of blog posts that I have been working on for years, taking many hours of regular searching through patent filings, and reading blog posts from within the Search and SEO industries, and reading through many patents that I didn’t write about, and many that I have. If you have questions about any of the signals I’ve listed, please ask about them in the comments. Some of the patents I have blogged about have not been implemented by Google yet but could be. A company such as Google files a patent to protect the intellectual property behind their ideas, the work that their search engineers and testing teams put into those ideas. It is worth looking at, reading, and understanding many of these patents because they provide some insights into ideas that Google may have explored when developing Google rankings, and they may give you ideas of things that you may want to explore, and questions to keep in mind when you are working on optimizing a site. Patents are made public to inspire people to innovate and invent and understand new ideas and inventions. I have added a section to this post that covers Additional Ranking Signals, after realizing that I missed at least one that I thought was really worth including, and anticipating adding more to this page. At some point in time, I may have to create a part 2 to this post, but I will decide that when it seems to make sense to do that. Organic Ranking Signals can impact and influence the order of pages appearing in Web-based search results. Those are the search results that aren’t narrowed down into more specific niches such as News or Local. Chances are that News Results and Local Results are influenced by different ranking signals than most other organic results, and understanding the differences can be helpful when you try to increase the visibility of sites in search results. It isn’t unusual to see Organic search results blended with non-organic search results because of Google’s Approach to Universal search and their use of a one box at the top of search results. This means that there may be a number of different ranking signals types being used for any one query. You may also see sites that focus upon providing informational results and transactional results for a query as well also blended together. Google does have a patent called Document scoring based on document inception date, in which they tell us that they will often use the date that they first crawl a site or the first time they see a document referenced in another site, as the age of that site. 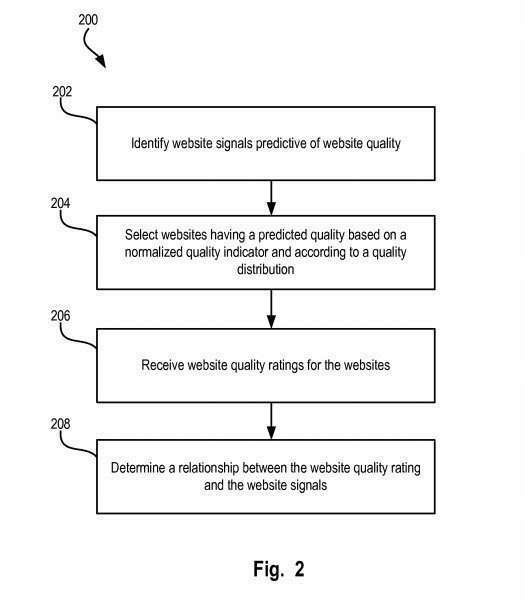 The patent also tells us that Google may look at the links pointed to a site, and calculate what the average rate of links pointed to a site may be and use that information to rank a site, based upon that linking. Action items: Create evergreen content that people will find value in over time, and continue to link to. As people continue to link to it, Google will continue to see value in that content. audience and keyword research, and use keywords that your targeted audience will use to search for your pages, and expect to see on your site. 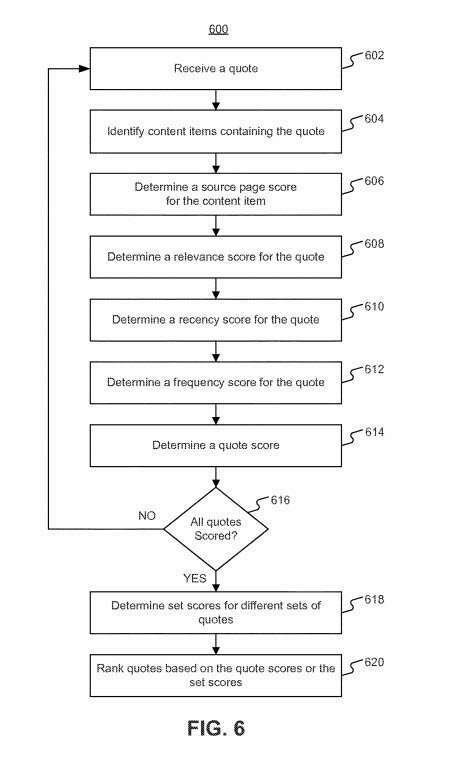 Google Recently updated its first phrase-based indexing patent, which tells us in its claims that pages with more related phrases on them rank higher than pages with less related phrases on them. That patent is: Phrase-based searching in an information retrieval system. Related phrases are phrases that are complete phrases that may predict the topic a page it appears upon is about. Google might look at the queries that a page is optimized for, and look at the highest ranking pages for those query terms, and see which meaningful complete phrases frequently occur (or co-occur) on those high ranking pages. Action Items: Look up the query terms that you have mapped out to pages on your site, and identify the most commonly occurring phrases on those pages. Consider adding some of those to your pages, so that you capture semantic themes that happen on those pages. You can use some of those phrases as anchor text where appropriate, which will have the impact of acting as if they are expert links from your pages. Don’t imitate the pages you find related words upon, but be inspired by them. Techniques are disclosed that locate implicitly defined semantic structures in a document, such as, for example, implicitly defined lists in an HTML document. The semantic structures can be used in the calculation of distance values between terms in the documents. The distance values may be used, for example, in the generation of ranking scores that indicate a relevance level of the document to a search query. Action Items: Make Sure that titles, main headings, and headings for lists on pages are descriptive of the content they head, and include keywords and related phrases that fit in with the content on the pages that they appear upon. Google has announced repeatedly that they consider Page Speed to be a ranking signal, including in the Google Blog post: Using site speed in web search ranking, and also in a patent that I wrote about in the post, Google’s Patent on Site Speed as a Ranking Signal. The load time of an online resource can be based on a statistical measure of a sample of load times for a number of different types of devices that the page or resource might be viewed upon. While it may appear to be based upon videos, there is a Google Patent that tells us that it may rank pages higher if they are watched for longer periods of time than other pages. The post I wrote about this patent on is: Google Watch Times Algorithm For Rankings?, and the patent it is about is, Watch time based ranking. Action Items: Keep on eye on the watch times reported upon for videos that you make to see if people stop watching them early, and identify where they might stop watching those. Make changes to make watching full videos something that people do. I wrote the post Google Patents Context Vectors to Improve Search, about the patent User-context-based search engine. The patent tells us that it may look at words that have more than one meaning in knowledge bases (such as a bank, which could mean a building money is stored in, or the ground on one side of a river, or what a plane does when it turns in the air.) The search engine may take terms from that knowledge base that show what meaning was intended and collect them as “Context Terms” and it might look for those context terms when indexing pages those words are on so that it indexes the correct meaning. Action Items: Visit knowledge base pages about the specific meanings of words, and find terms on those pages that might give your pages about the same meanings of those words more context. For example. if you are writing about Jaguars, and it could be the Jacksonville Jaguars, the breed of Cat, or the Apple Operating system, make sure to use words that help explain the context of the meaning of Jaguars that you have intended to write about. Getting that context right can help the search engine to know what you meant when you optimized your page for that term. Google may give pages quality scores based upon language models created from those pages when it looks at the ngrams on the pages of a site. This is similar to the Google Book Ngram Viewer. The closer the quality score for a page is to a high-quality page from a training set, the higher the page may rank. Action Items: Creating content that is high quality should become a priority. That may require hiring experienced copywriters or proofreaders or the use of editing programs such as Grammarly or Hemingway. This may sound a little like #8 above. Google may use ngrams to tell if the words on a page are gibberish, and reduce the ranking of a page. I wrote about this in a post titled, Google Scoring Gibberish Content to Demote Pages in Rankings?, about the patent Identifying gibberish content in resources. Ngrams from a complete page might be collected like that, and from a collection of good pages and bad pages, to build language models (and Google has done that with a lot of books, as we see from the Google Ngram Viewer covering a very large collection of books.) It would be possible to tell which pages are gibberish from such a set of language models. This Gibberish content patent also mentions a keyword stuffing score that it would try to identify. Action Items: Google has been performing ngram analysis on lots and lots of books and documents. There are programs that will spit out gibberish that you can purchase, or you can hire someone to produce content for you, but chances are good that Google and visitors to your site will be able to recognize low-quality content, and that may cause Google to consider your site to be low quality, and not rank it highly. If you have quality content, people may find value in it, and return to your pages, and refer others to your site. In the post Authoritative Search Results in Google Searches?, I wrote about the patent Obtaining authoritative search results, which tells us that Google might look at the results of a search, and if none of the Pages in the SERPs that appear are authoritative enough, it might search upon one of the query refinements that are listed with those results to see if they return any authoritative results. In general, an authoritative site is a site that the search system has determined to include particularly trusted, accurate, or reliable content. The search system can distinguish authoritative sites from low-quality sites that include resources with shallow content or that frequently include spam advertisements. Whether the search system considers a site to be authoritative will typically be query-dependent. For example, the search system can consider the site for the Centers for Disease Control, “cdc.gov,” to be an authoritative site for the query “cdc mosquito stop bites,” but may not consider the same site to be authoritative for the query “restaurant recommendations”. A search result that identifies a resource on a site that is authoritative for the query may be referred to as an authoritative search result. Action Items: Google has been publishing Quality Raters Guidelines where they define what they mean by such terms as Expertise, Authoritativeness, and Trustworthiness. It can be really helpful to go through those guidelines and understand what they mean by those terms. They do update those guidelines on an occasional basis, and it is worth keeping an eye out for when a new version comes out, so you can keep aware of any changes they may make to those. This patent doesn’t seem to have been implemented yet. But it might, and is worth thinking about. I wrote the post How Google May Rank Websites Based Upon Their Databases Answering Queries, based upon the patent Resource identification from organic and structured content. It tells us that Google might look at searches on a site, and how a site might answer them, to see if they are similar to the queries that Google receives from searchers. Action Items: Google doesn’t appear to be using this patent yet, but they could. It ranks sites (potentially large site such as job sites and travel sites) on the databases that supply answers to visitors of those sites. If the answers it returns are to queries that are similar to the queries that users of a search engine perform, then the sites those databases are on will rank higher. You can get a sense of the questions that people may ask using Google’s keyword prediction tool. It is impossible to tell whether or not Google will implement this patent, but it is possible. Another time that Google publicly stated that “just because we have a patent doesn’t mean we use it, came shortly after I wrote about a patent in a post I called The Google Rank-Modifying Spammers Patent based upon the patent Ranking documents. Implementations consistent with the principles of the invention may rank documents based on a rank transition function. The ranking based on the rank transition function may be used to identify documents that are subjected to rank-modifying spamming. The rank transition may provide confusing indications of the impact on rank in response to rank-modifying spamming activities. Implementations consistent with the principles of the invention may also observe spammers’ reactions to rank changes to identify documents that are actively being manipulated. Action Items: Learn about the Google Webmaster Guidelines, and avoid doing things that Google might consider to be manipulative. If you make changes to your site to try to improve the SEO of the site, and you don’t see any impact from those changes, don’t panic, and don’t take any actions that Google might perceive to be negative. The following advantages are described by the patent in following the approach it describes. Events in a given location can be ranked so that popular or interesting events can be easily identified. The ranking can be adjusted to ensure that highly-ranked events are diverse and different from one another. Events matching a variety of event criteria can be ranked so that popular or interesting events can be easily identified. The ranking can be provided to other systems or services that can use the ranking to enhance the user experience. For example, a search engine can use the ranking to identify the most popular events that are relevant to a received search query and present the most popular events to the user in response to the received query. A recommendation engine can use the ranking to provide information identifying popular or interesting events to users that match the users’ interests. 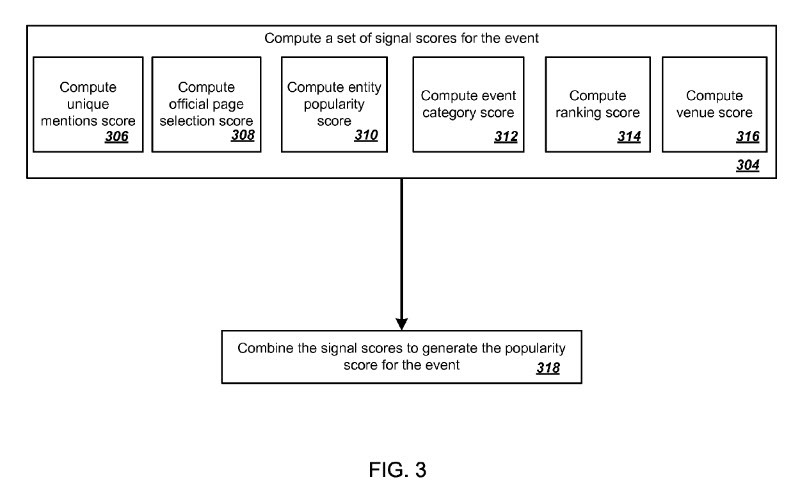 Action Items: The things mentioned in the patent drawing are worth paying attention to Times mentioned, Page selections (in search results), entity popularity, ranking score, venue score. Finding ways of increasing those things might help increase how your event may rank in search results. I came across an update to the reasonable surfer patent, which focused more upon anchor text used in links than the earlier version of the patent, and told us that the amount of weight (PageRank) that might pass through a link was based upon the likelihood that someone might click upon that link. The post is Google’s Reasonable Surfer Patent Updated based upon this patent Ranking documents based on user behavior and/or feature data. Since this is a continuation patent, it is worth looking at the claims in the patent to see what they say it is about. They do mention how ranking is affected, including the impact of anchor text and words before and after a link. identifying: context relating to one or more words before or after the links, words in anchor text associated with the links, and a quantity of the words in the anchor text, the weight being determined based on whether the particular feature data corresponds to the stored feature data associated with the one or more links or whether the particular feature data corresponds to the stored feature data associated with the one or more other links, the rank being generated based on the weight; identifying, by the one or more devices, documents associated with a search query, the documents, associated with the search query, including the particular document; and providing, by the one or more devices, information associated with the particular document based on: the search query, and the generated rank. Action Items: When you find ways to link to other pages, the more likely it is that someone may click on those links, the more weight those links will likely pass along. One of my favorite pages on linking is one that focuses upon User Experience because it aims at creating links that people will find value in clicking upon. The post is Getting Confidence From Lincoln, about using the right trigger works as anchor text in a link and giving confidence that they will find what they are looking for on your pages. Placing links in places such as footers instead of in the main content of a page may also be something that could give them less confidence about clicking through, and decrease the likelihood that they will. This patent was one that I wondered about whether or not Google would implement, and suspect that many people would be upset if they did. I wrote about it in Satisfaction a Future Ranking Signal in Google Search Results?, based upon Ranking Query Results Using Biometric Parameters. Google may watch through a smart phone’s reverse camera to see the reaction of someone looking at results in response to a query, and if they appear to be unsatisfied with the results, those results may be demoted in future search results. 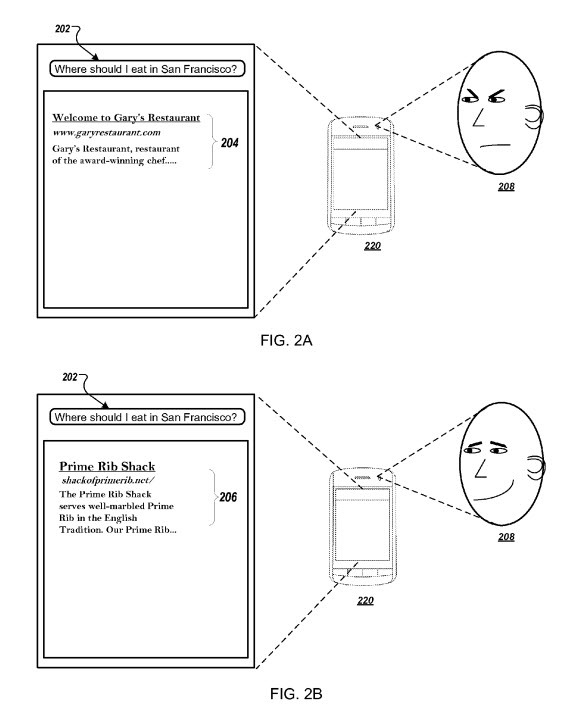 Action Items: How people react to seeing your site in search results may have an impact, as described in this patent. Even if this patent isn’t implemented, having people respond positively to seeing your site in search results could increase the numbers of people clicking through to those results. So make sure that your page titles and snippets (meta descriptions that contain the query terms your page is found for) are engaging and persuasive. Finding ways to have those snippets be rich ones can also increase and improve satisfaction with people seeing your page in search results. Target that as a goal for your site. Rand Fishkin sent me a message saying that his experience has been that clicks were counting as ranking signals, but he was also seeing thresholds of around 500 clicks before clicks would make a difference. It’s difficult to tell with some signals, especially when Google makes statements about them not being signals in use. Rand’s tweet in response to my post, about his experiment. Action Items: There are a few ways to potentially improve click-throughs to your site. These can include making your titles and your snippets more persuasive, and engaging. Making sure that site links show for your site in search results. Making sure that a knowledge panel might show for your site. Building your brand to be one that people recognize and look forward to seeing something from. If you search for “seobythesea named entities” it is a signal that you have an expectation that you can find information about named entities on the site seobythesea.com. If you do a site operator search such as “site:http://www.seobythesea.com named entities” you again are showing that you expect to be able to find information about a particular topic on this site. These are considered queries that refer to a particular site. They are counted against queries that are considered to be associated with a particular site. So, if there are more referring queries than associated queries, the quality score for a site is higher. The site quality score for a site can be used as a signal to rank resources or to rank search results that identify resources, that are found in one site relative to resources found in another site. Action Items: If your site can be perceived as one where people can find answers to questions that they may have in your industry, it may be targeted by queries that are intended to find information about specific topics, as if people might have expectations that they can find information or answers on your site. That is the sign of a high-quality site that this patent aims at uncovering. So, look for the kinds of questions that people who might be in your audience may want to know more about, and work on answering the questions they may have, or writing about topics that have an interest in. The more you are capable of doing that the higher the quality of your site might appear to be. Like the patent about covering terms with more than one meaning by including context terms on their pages, when you write about people who may share a name with someone else, if they are also on sites such as Wikipedia, and disambiguated entries, make sure you include context terms on your page that makes it easier to tell which person you are writing about. Action Items: If you are going to write about a person, search to make sure there aren’t other people with the same name on the Web, and if there are include information about them that makes it easy for a search engine and visitors to understand which person you are writing about. You could include person schema on that page that helps to identify which person your page is about as well. If you search for something on a phone such as a song, and you have a music app on that phone that has that song upon it, Google may tell you what the song you are searching for is, and that you can access it on the app that you have loaded on your phone. Social network affinities seem to be related to this. If you ask a question that might involve someone whom you might be connected to on a social network, they might be pointed out to you. See Effectiveness and Affinity as Search Ranking Signals (Better Search Experiences) about Ranking search results. Action Items: There may still be value in using places such as Google+ and Twitter to share and show off your expertise on specific topics that you may be known for and connected to other people on those networks. Google authorship markup was something that they were showing for people whom they considered to be authoritative on specific topics for. It’s possible that you may not get value for that authoritativeness from search results anymore, but it is possible that word of mouth may still have some value. Google was still holding on to authoritativeness in the patent I wrote about in the post Has Google Decided that you are Authoritative for a Query?. Google still shows that they value expertise, authoritativeness, and trustworthiness in the Quality Raters Guidelines, so if you build those traits into the social media sites that you maintain, and that crosses into your website, that may have continuing value. Google seems to know who said what and has a patent on it. See Google Searching Quotes of Entities on the patent Systems and methods for searching quotes of entities using a database. Action Items: The claims for the patent tell us that they might try to understand whom the entity is from, by looking at Google’s Knowledge Graph, so using Schema to identify that entity might not be a bad idea. Could visits to specific categories of a site have a positive effect on the rankings of those visited sites? We know that people from Google have said that use behavior signals like this tend to be noisy; but what are you to think when the patent I was writing about describes ways to reduce noise from such signals? The post is A Panda Patent on Website and Category Visit Durations, and it is about a patent co-authored by Navneet Panda titled Website duration performance based on category durations. Action Items: Finding relevant and meaningful information and images and video that might cause people to stay on a page longer, which can create a positive visitor experience, may be a good idea. We see Google doing this in search results with “People also ask” questions and answers. If people are having their informational and situational need met and having positive experiences on the pages that Google sends them to, that seems to be a positive experience. I want to believe when Google Spokespeople say that Google doesn’t use click data to rank pages, but I keep on seeing patents from Navneet Panda that Google’s Panda Update was named after which describes user behavior that may have an impact. Action Item: The Patent tells us that repeat clicks are from when the same people perform the same searches and select the same pages in search results, to return to a page that they had visited before. The patent takes that kind of search behavior as a positive sign, and also long durations of visits on pages as well. Do you have content on your site that people might perform the same searches for, and revisit your pages to get to? It might be worth creating some content like that if Google is going to consider it to be high-quality content. Google can listen to a television playing, and respond to a question such as “Who is starring in this movie I am watching? Action Items: I asked Google Now three times this morning if it knew what song was playing on my desktop computer. It didn’t have an answer for me. I keep on trying because I expect that it one day will. It’s impossible to tell when features like this might possibly happen, but interesting seeing when Google might be able to recognize songs you listen to or Movies that you might watch, and I anticipate it will develop an ability to do something like this. Until it does, I plan on testing Google occasionally. Google might attempt to estimate how much traffic links to a site might bring to that site. If it believes that the links aren’t bringing much traffic, it may discount the value of those links. I wrote about this in the post Did the Groundhog Update Just Take Place at Google? Action Items: Pursuing high-quality links to content on your site should ideally target places that might deliver traffic to your site, rather than just link equity. This might work effectively by pitching content to media sources or sharing information about content to places that might consider sharing a link to others. Ideally, a link that delivers traffic would be the best places to receive links from. 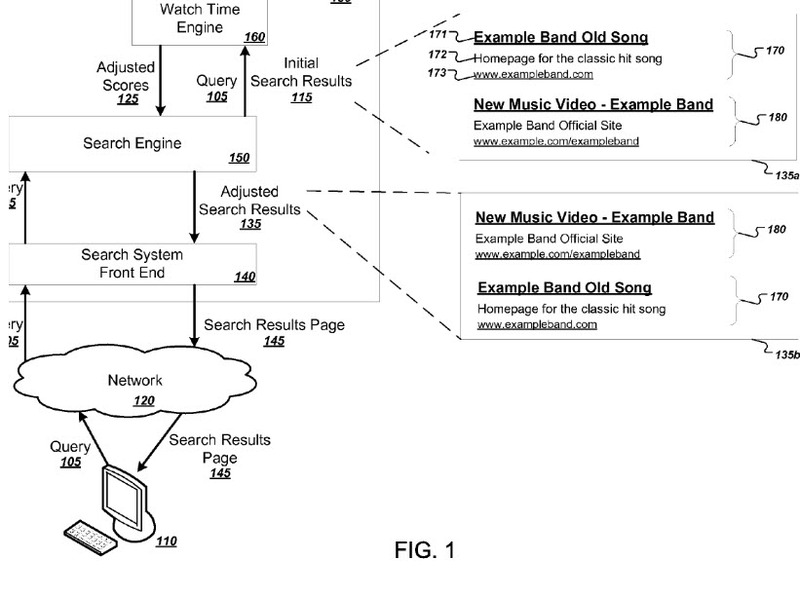 I wrote a post about this called New Google Freshness-Based Ranking Patent. Action Items: I was reminded of how John Kleinberg defined burstiness, and how Microsoft came out with a similar patent in the past. Burstiness is a good concept to know if you do SEO. If a person has a history of interaction with specific media, such as watching a particular movie or video or listening to a specific song, their searches may be influenced by that media, as I described in Google Media Consumption History Patent Filed. That is based upon this patent , Query Response Using Media Consumption History. Action Items: This is another patent that doesn’t appear to have been implemented yet. But thinking of the possibilities of Google featuring celebrities in knowledge panels, which sometimes have advertisements in them, and a possibility of cross-channel advertising, this does seem like something we will see implemented if possible. It’s possible that apps such as Google Lens may be leading in this direction, as well as actions associated with voice searches. Plus Google has patents on things such as Google Cross-Device Tracking and Audio Watermarks. A patent called Determining geographic locations for place names in a fact repository was updated in a continuation patent, which I wrote about in Google Changes How they Understand Place Names in a Knowledge Graph. 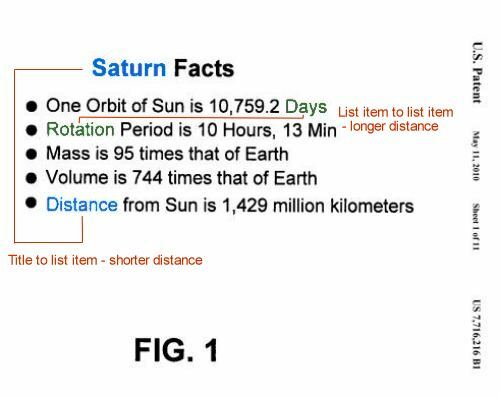 Action Items: It is possible to include latitude and longitude geographic coordinates in Schema vocabulary on a site, to indicate location. A post that looks at links pointed to a site, such as from footers of other sites, and might discount those, and links from sites that tend to be redundant, which it may not count more than once is the one at How Google May Classify Sites as Low-Quality Sites. Action Items: If you have control over the links that are used from one site to another one, reviewing those may be a good idea. The links from Page footers or that appear on every page in redundant ways may have been discounted, and may have very little to no value. 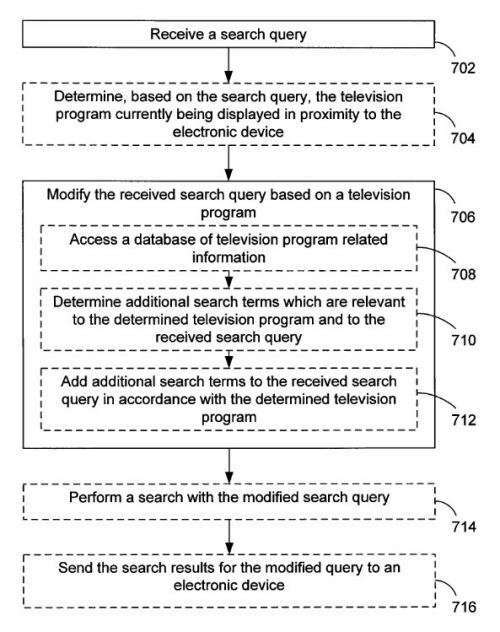 Google may try to track what is playing on television where you are located, and watch for queries which look like they might be based upon those television shows, which I wrote about in Google Granted Patent on Using What You Watch on TV as a Ranking Signal. Action Items: Google may become much more aware of what is playing when on television where you live. That awareness may impact what you see when searching for something that may be related to that television content. That may be worth testing and being aware of. We know that Google uses Human Raters to evaluate sites. Their rankings of pages may influence the rankings of pages, which I wrote about in the post How Google May Rank Web Sites Based on Quality Ratings The post identifies and explains a few quality signals that might be included in raters evaluations, such as whether it has a broad appeal or a niche appeal, what the click rate or blog subscription rate or PageRank Score might be. Action Items: I recommended this above, but it fits well here, so I’ll make the same recommendation. Read the Google Quality Raters guidelines about how quality raters review sites. It seems to make sense to understand what they are judging sites on as you build them. Google recently published a patent which showed how Structured data in the form of JSON-LD might be used on a page and might cause Google to search for values of attributes of entities described in that structured data, such as what book was published by a certain author during a specific time period. The patent explained how Google could search through the structured data to find answers to a query like that. My post is Google Patent on Structured Data Focuses upon JSON-LD, and the patent it covers is Storing semi-structured data. Action Items: Visit the Schema.org website and look at some of the example Schemas and the different types of markup examples of those. Also, consider joining the Schema.org community and joining the community mail list. There are Schema extensions which will make schema grow, and being part of the community gives you a chance to be part of that, and to learn about how it happens. A search for an entity with a property or attribute that may not be the most noteworthy, but may be known may be findable in search results. In a post about this, I used an example query about “Where was George Washington a Surveyor?” since he is most well known for having been President. The post is Related Entity Scores in Knowledge-Based Searches, based on the patent Providing search results based on sorted properties. Action Items: it is worth doing some searches for different entities, and seeing what else is included in knowledge panels for those, such as the ones for Tom Hanks and William Shakespeare. I stood in front of a statue in my town and asked my phone what the name of the statue in front of me was. It didn’t give me an answer, but I suspect we may see answers to questions like this in the future (and information about stores and restaurants that we might be standing in front of as well. I wrote about how this might work in the post How Google May Interpret Queries Based on Locations and Entities (Tested). It is based upon the patent Interpreting User Queries Based on Nearby Locations. This is worth testing again, I am traveling to Italy in November, and I’m hoping it works for my trip then, so I can ask for reviews of restaurants I might stand in front of when there. Action Items: Google will keep track of the locations of different entities (points of interest and local entities, such as businesses). It’s worth opening your phone in front of places and asking it if it knows what entity you might be in front of. I know that Google has an idea of what I am near when I take some photos because it asks me if I would like to submit my photos taken at a place or just outside of it, to Google Maps. If Google knows a location for Google Maps, it can know what is at a location for Google Search with some work. We will see how long it takes Google to start returning search results based upon locations. Asking questions about facts from entities such as movies or books, and Google being able to answer such queries is a good reason to make sure Google understands the entities that exist on your web pages. I wrote about such searches in the post How Knowledge Base Entities can be Used in Searches. Action Items: It is possible to ask questions about books and movies, and facts related to them. and get search results that sometimes search results, and sometimes featured snippets, or carousels. One of the best ways to learn about these may be to ask lots of questions about books and movies, such as “What town did the movie Footloose take place in? or “Who Starred in Barney Miller? Featured Snippets may be answered from high authority Pages (ranking on the first page for a query) that show the natural language question to be answered, and a good answer to that question. The questions are ones that follow a common pattern for questions ask on the web, such as “What is a good treatment for X?” I wrote about such search results in the post Direct Answers – Natural Language Search Results for Intent Queries. Action Items: Google Spokespeople have hinted that there have been a few different approaches behind the display of featured snippets. My post and the patent that goes with it is just one approach. There likely are other approaches, and this is an area that is still in its infancy when compared to link-based rankings of search results. How far someone may be will to travel to a place may be a reason why Google might increase the ranking of a business in local search results. I wrote about this in the post Ranking Local Businesses Based Upon Quality Measures including Travel Time based upon the patent Determining the quality of locations based on travel time investment. …the quality measure of a given location may be determined based on the time investment a user is willing to make to visit the given location. For example, the time investment for a given location may be based on a comparison of one or more actual distance values to reach the given location to one or more anticipated distance values to reach the given location. Action Items: Sometimes Google Maps navigation doesn’t work correctly, and will tell you in the middle of a highway that “You have arrived.” The place you were trying to get to isn’t in sight. Try it with your business and make sure that it is working correctly to get people to your business. Showing up highly in search results in Maps listings is good, but not if Google is losing people trying to get to your door. It’s worth checking upon if you haven’t. It does work correctly most of the time, but not all of the time. If it is having problems getting people to your door, make sure that the directions to your business on your site are very easy to follow, and that signage for your business is easy to see from the street. In the post How Google May Respond to Reverse Engineering of Spam Detection, I wrote about the patent Reverse engineering circumvention of spam detection algorithms. I remembered how Google responded when people brought up the Google Rank-Modifying Spammers Patent, that I wrote about in #13, telling people that just because they had a patent doesn’t mean they necessarily use it. A spam score is assigned to a business listing when the listing is received at a search entity. A noise function is added to the spam score such that the spam score is varied. In the event that the spam score is greater than a first threshold, the listing is identified as fraudulent and the listing is not included in (or is removed from) the group of searchable business listings. In the event that the spam score is greater than a second threshold that is less than the first threshold, the listing may be flagged for inspection. The addition of the noise to the spam scores prevents potential spammers from reverse engineering the spam detecting algorithm such that more listings that are submitted to the search entity may be identified as fraudulent and not included in the group of searchable listings. Action Items: The Google support Page titled Improve your local ranking on Google introduces the things that Google looks at when ranking Local results in Google Maps. A little different way of looking at rankings in Google Maps can be found at Was Google Maps a Proof of Concept for Google’s Knowledge Base Efforts?, which focuses upon structured data. When specific facts about a local entity is spammed, it throws off consistency of those facts. Another patent that is about spam in local search is one I wrote about in the post Google Fights Keyword Stuffed Business Names Using a Surprisingness Value written about the patent Systems and methods of detecting keyword-stuffed business titles. Action Items: The Google Local Guides program puts feet on the street to answer questions about places with unusual names, which is something that Google didn’t have, and which can be helpful. If you haven’t looked int the local guides program, you should think about joining. Participating in it will give you an idea of the questions that they ask about businesses. It’s worth checking out. I’ve been hearing people suggest that reviews can help a local search rank higher, and I have seen reviews considered equivalent to a mention in the Google patent on Location Prominence. But, I’ve now also seen a Google patent which tells us that a review from a local expert might also increase the rankings of a local entity in local results. My post was At Google Local Expert Reviews May Boost Local Search Results on the patent Identifying local experts for local search. Action Items: People do perform searches to find reviews. If there aren’t reviews about a business type that I might be interested in, I will sometimes ask people whose opinions I value. Word of mouth can be pretty valuable, and people often will look for opinions from people whom they perceive to be like them. One of the last reviews I left a place was at a tire store, which had a sign suggesting that people leave a review on their yelp page. The service was good, and they gave me a good deal. I left a review. This was interesting that Google might consider some reviewers to be local experts. When you search for a local coffeehouse, Google may decide that it wants to show you similar local businesses, and may include some other coffee houses or other similar results in what you see also. I wrote a post on this called How Google May Determine Similar Local Entities, from the patent Detection of related local entities. Action Items: It’s good knowing that Google is willing to show similar businesses in searches that you might search for. Finding something that makes your business stand out in a way that could cause people to drive further to get to you is probably a good idea. I see that happen near me with many restaurants that are located on Historic Highway 101, and are modeled after diners or historic places. Not necessarily an SEO approach, but what do you do to stand out? Action Items: If your business is located near a busy corridor that many people travel down for their daily commutes, your business may show up as near them, when they search for different types of businesses if Google is showing them places based on a distance from a location history. I like having a directions page that shows how to visit from local area landmarks – this doesn’t necessarily help your ranking, but it may help deliver visits to you from people who are familiar with the area, and know where the local highways and airports are. Search for a place that you might visit, and the query refinements that you might see may be based upon what people at that location you are considering visiting may have searched for when they were visiting that place. The “Leo Carrillo” example above is for a ranch that was converted into a state park where many people get married at, and chances are the queries shown are from people searching from that park. This doesn’t affect the rankings of the results you see, but instead the query refinements that you are shown. See Local Query Suggestions Based Upon Where People Search based on Local query suggestions. Action Items: If you are considering visiting a place that you haven’t been to before, looking at the query refinements that appear at the bottoms of searches can give you ideas on what else people might search for when they are at that location. Knowing that may surface ideas for content that you create on your site or marketing that you might do in your area. It is a good thing to know, about your location. Action Items: There may be ways of including geographically relevant content on the pages of your site that can help it rank better for organic searches. Having your business rank well for maps results and organic results can make it more likely that your business is seen in search results. Aim for both. Action Items: If you are interested in voice search at Google, you should read a case study they published in 2010: Google Search by Voice: A case study It is about some of the technological issues that Google faced when setting up voice search. It also discusses some of the metrics that Google uses to determine the quality of their voice search. Language modeling and location impact on those language models makes a difference, too. Action Items: The patent says “originality” but tells us that freshness and recency are also important. It looks like being the first to get a scoop on a topic, and having the most original takes on that story still has a lot of value in news results. That probably wouldn’t come as a surprise to anyone covering the news. Making sure that translates well to the written word is important. Part of this approach is one that reminded me of Topic Sensitive PageRank. Some of it is based upon a global ranking for a site, and onsite rankings for pages of a site. Different types of relevance may matter under this approach including Topical Relevance to other sites, Authoritative Relevance to other sites, and Off-site factors that indicate authority on site. Reliabilty is also a concern as well. This does appear to be an alternative to PageRank that is worth considering as a ranking signal. I wrote about this in a post titled A Replacement for PageRank?, and it is based upon the patent Onsite and offsite search ranking results. Action ItemsCarefully consider the themes presented in the site, and how much of the site covers each of those. Work to improve relevance and authority, and reliability of all parts of a site. I have mostly focused upon including google signals that I have written about in this post going back five years. It’s quite possible that I missed out on some, but I ideally wanted to provide a list that included ranking signals that I have written about and could point to patents about. I’ve mentioned that Google spokespeople have sometimes said that “Just because Google has a patent on something doesn’t mean that they are using it.” That is good advice, but I do want to urge you to keep open the idea that they found certain ideas important enough to write out in legal documents that exclude others from using the processes described in those documents, so there has been a fair amount of effort made to create the patents I point to in this post. Google Ranking Factors versus Google Ranking Signals – It was a little difficult deciding what to call this post because I have heard both factors and signals I remembered a Search Engine Strategies Conference session with a number of search engioneers speaking, and I asked a question during the Q&A section about a certain search ranking factor. They started to answer by telling me that they always referred to search ranking factors as search ranking signals. I try to use search ranking signals since learning about that. I do look forward to hearing your thoughts about the ranking signals that I have covered in this post. Copyright © 2018 SEO by the Sea ⚓. This Feed is for personal non-commercial use only. If you are not reading this material in your news aggregator, the site you are looking at may be guilty of copyright infringement. Please contact SEO by the Sea, so we can take appropriate action immediately. The post Five Years of Google Ranking Signals appeared first on SEO by the Sea ⚓.